This add-on is operated by Amakawa Pte. Ltd.
openredis is an add-on that provides access to a Redis database. Redis is an open source, advanced key-value store. It is often referred to as a data structure server since keys can contain strings, hashes, lists, sets and sorted sets. More information can be found at redis.io. openredis is accessible via an API and has supported client libraries for C, C#, C++, Clojure, Dart, Erlang, Fancy, Go, Haskell, Io, Java, Lua, Node.js, Objective C, Perl, PHP, Python, Ruby, Scala, Smalltalk and Tcl. Once openredis has been added an OPENREDIS_URL setting will be available in the app configuration and will contain the canonical URL used to access the newly provisioned Redis instance. This can be confirmed using the heroku config command. After installing openredis the application should be configured to fully integrate with the add-on. 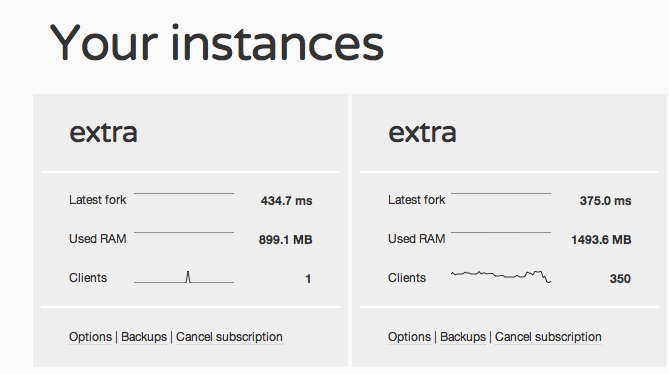 You can open your openredis dashboard and view the current memory usage of your instance by using the heroku addons:open command. It’s important to note that access to your database is restricted to the AWS cloud. Ruby on Rails applications will need to add the following entry into their Gemfile specifying the openredis client library. Install Jedis by following the author’s instructions. When developing locally it is best to turn off the integration with openredis to minimize dependencies on remote services. You can use a local Redis server, and point OPENREDIS_URL to localhost and the appropriate port. Make sure you can connect with redis-cli. If that works, check you are getting the credentials right in your application. For support questions, you can find us at #openredis on Freenode, mention @openredis on Twitter, or simply email us at info@openredis.com. After that, a new instance, with a new URL will be provisioned. Your OPENREDIS_URL will also be updated automatically and your application will be restarted gradually. If you’re not using the OPENREDIS_URL variable directly, your application will not get the changes. Please update your app first to use OPENREDIS_URL before upgrading, or make sure you change any custom REDIS_URL you are using to the new OPENREDIS_URL value. openredis can be removed via the CLI. Before removing openredis a data export can be performed by setting up a local instance of redis-server as a slave of the openredis instance. All openredis support and runtime issues should be submitted to one of the Heroku Support channels. Any non-support related issues or product feedback is welcome at info@openredis.com.